PHOTO A: With a slot-cutting hit (See inset photo) in the router table, rout a Vi-in.-wlde x ^-in.-deep groove Into the edge of the tabletop rail stock. Use a featherboard to hold the stock against the fence. PHOTO B: Cut the tabletop rails to length with a 22 Vi° angle on each end. 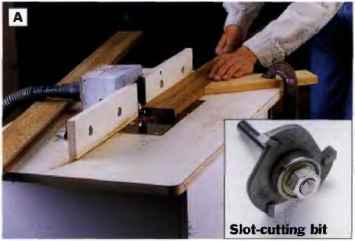 Attach an angled stop block to the saw table for consistent cuts. O Surface plane your tabletop stock to % in. thick and rip-cut to 3 ¥4 in. wide. Hip enough teak stock to make all eight tabletop rails. © Install a chamfer bit in the router table and cut a Is-in. chamfer along the tup and bottom of one long edge of the tabletop rail work pieces. © Install a 14-in. piloted slot-cutting bit in the router table and set the bit height Va in. off the surface of the router table so the cutter will rut a ce ntered Vi-in.-wido slot in the stock. Set the fence for a Vi>-in.-deep cut. Rout a slot along the chamfered edge of the stock (See Photo A). ©Set the blade of a power miter saw 22Y2° to the right of 0° and lock the angle setting. Cut this angle on a strip of scrap lumber to serve as a «lop-block and flip it against the saw fence so its angle is opposi te the blade angle. Set a length, of tabletop stock against the saw fence with the slot against the fence and trim the workpiece near the end. Then flip the tabletop stock so the slot faces out. The scrap stock angle and the tabletop stock angle; should now fit together to form a 45" angle. Interlock these parts anrl slide the tabletop stock/scrap block assembly along the saw fence until the blade will cut the tabletop stock piece at 7 Hie, yielding a rail that's 7Hie in. long on its edge with the slot on its narrow end. Fasten the stop-block to the saw table at this location (we used a screw) and cut the first tabletop rail (See Photo B). This setup will allow you to cut the tabletop rails one after the other without moving the stop-block. © Cut seven more rails, being careful to keep the slot side on the short edge of each rail. To do this, you'll need to flip the stock over, cut off the enrl angle and flip the stock back with each new rail you cut. PHOTO D: Glue the splhes Into the tabletop rail end grooves. Wipe the mating parts first with mineral spirits to remove the natural oils In the weed. Spread the glue evenly wttti a glue brush. 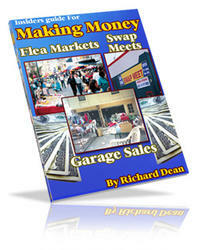 Wear latex gloves and have mineral spirits and a rag handy to wipe up squeeze-out. PHOTO E: Clamp the top rail assembly with a strap damp, leaving two opposite Joints unglued. Use wax paper around the glued corners to keep the strap from bonding to the wood. PHOTO F: Insert spacers between the slats and damp them together. Lay the rail assembly over the slats and trace the interior of the assembly unto the slats. rail (the grooves will house the splines). Use a piece of ;14-in. scrap with a 22Yf angle cut on one side as a push block to guide the rails and keep them from chipping out at the back edge (See Photo C). O Cut eight splines that are Va x 1 x 23-it in. each, Thrn glue up the tabletop rails in two sections of four rails each. Wipe the mating surfaces with mineral spirits first, then apply polyurethane glue to the side grooves on each rail and insert the splines (See Phot« D). The spiincs won't extend the full length of the joint, so align the splines flush with the bottom of the groove in the short side of each rail. 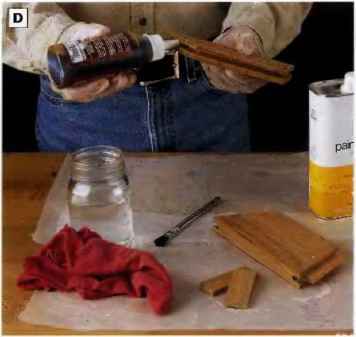 NOTE: Polyurethane glue cures by reacting with the moisture in the wood, so moisten the splines before assembling each joint. O After the two rail sections are assembled, fit. them together with two splines (don't use glue) and clamp the tabletop together tightly with a strap clamp (See Photo E). You'll glue the two tabletop sections together later. Slip wax paper between the corncrs and the clamp's strap to keep glue squeeze-out from gluing the clamp to the rails. Let the setup dry thoroughly, then remove the clamp. © Rip stock to width for the 2-in. inside and 2V^-in. Outside tabletop slats and cross-cut them to length. (E) On a flat surface, lay out the slats edge-to-edge, with the outside slats at the ends. Insert Va-in. spacers to get the gaps between the slats (See Photo F). ©Measure out Yi in. beyond the traced lines on all slats to allow for the length of the slat tenons, anH draw new cutting linos using a straightedge or marking gauge. Remove the damps and cut the slats one at a time along the cutting lines. PHOTO G: Cut tenons into the angled ends of the slats with a Vi-in. straight bit (See inset). 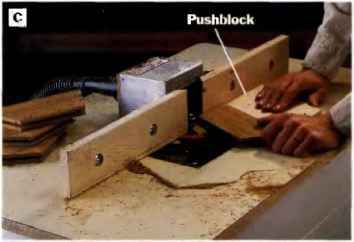 Use an angled pushblock to guide the work. PHOTO I: Glue and clamp the two halves of the tablet op rail assembly together with polyurethane glue and a strap clamp. Cover the glued corners with wax paper. Nail, rather than glue, the slats In place. PHOTO i: Use a trammel to mark an 18-ln.-dia. 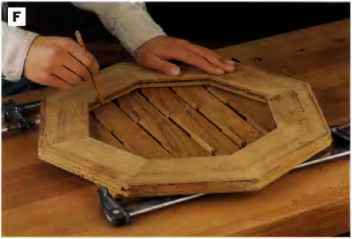 circle onto the underside of the tabletop, and cut it round with a band saw or jig saw. Photo G). Note: Use a piece of angled scrap as a pushblock to guide the slats and keep the bit from tearing out the slat ends. Dry-fit the slats into the top rail assembly, again inserting the V4-in. spacers. Trim the slat tenons, as needed, to fit. © Disassemble the tabletop pieces and chamfer the edges and ends of all the slats and tabletop rails on the router table (See Photo H). We used a veining (V-groove) bit in the router table to cut the chamfers, and used the fence as a guide. Finish-sand all parts for the tabletop. © Reassemble the tabletop and glue the final two splined joints. Use a band clamp to secure the assembly (See Photo I). Do not glue the slats. Instead, pin the joints through the center of each tenon by nailing one Vi-in. stainless-steel brad up into each tenon. This will allow the slats to expand and contract with changes in temperature and humidity, especially if the table is kept outside. Let the glue dry. © Lay the tabletop facedown. Place a 14-in. spacer snugly into the gap between the two center slats, and measure and mark the centerpoint of the tabletop assembly onto the spacer. Pin a piece of scrap to the spacer to serve as a trammel, and scribe an 18-in.-dia. circle around the centerpoint (See Photo J). 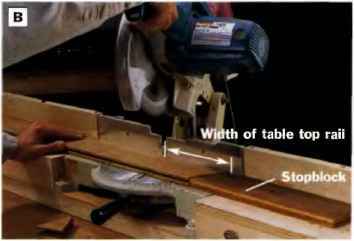 Cut out the tabletop along this cutting line with a jig saw or a band saw. Sand the edge smooth, and use a piloted chamfer bit to rout a Vfe-in. chamfer around the top and bottom edge of the tabletop. PHOTO K: Drill out the leg mortises on the drill press to ViAn. depth. Clean up the waste from the shoulder of the mortises with a chisel. PHOTO L: Glue and clamp the legs and rails together. Use clamp pads between the clamp jaws and mineral spirits to clean up squeeze-out. © Rip- and cross-out the four legs and four aprons to size. 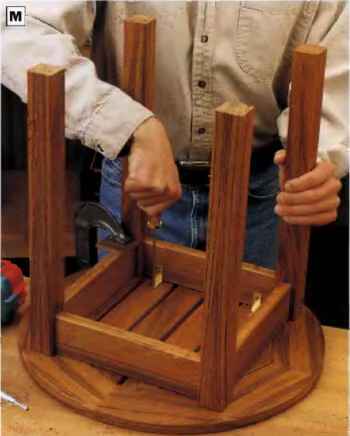 ©Lay out two Win.-wide mortises in the top of each leg, centering them on two adjacent sides. The mortises should be 2 in. long, starling W-in. down from the top ends (See Detail: Mortise & Tenon Joints, page 335). Cut the ^-in.-deep mortises by drilling side-by-side Vi-in.-dia. holes on the drill press, then clean and square up the mortises with a wood chisel to the layout lines (See Photo K). © Use a table saw and a tenon jig or router and straight bit to cut a 14-in.-thick x Vi-in.-deep x 2-in.-long tenon on each end of all four leg rails. © Rout a l£-in. chamfer on all edges of the table legs and the two lower edges of each leg apron. Finish-sand these parts. 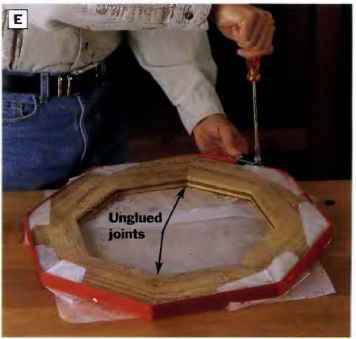 © Glue and assemble the legs and leg rails with the rail chamfers facing the leg bottoms using pulyurethane glue and clamps (See Photo L). Use clamp pads between the clamp jaws and legs, to protect the wood. © Lay the tabletop facedown and set the leg assembly on top of it. Attach the leg rails to the underside of the top with four brass L-brackets and Vi2-in. brass or stainless-steel screws (See Photo M). Drill pilot holes for the screws first. PHOTO M: Attach the tabletop to the rails and legs using brass L-brackets. Drill pilot holes before driving the screws. 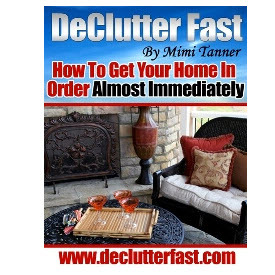 © Finish the table with teak oil if you plan to use the table indoors. If the table will be used outdoors, you can leave it unfinished to weather to a silvery gray or topcoat it with wood preservative with UV protectant to retain the color of the wood. The natural oils in teak will resist rot and insects. Attach nylon glides to the foot bottoms so the legs won't absorb water through their ends.